Sister Violene Jackson was born August 23, 1932 to parents York and Gertrude Singletary (deceased) of Crestview Florida. 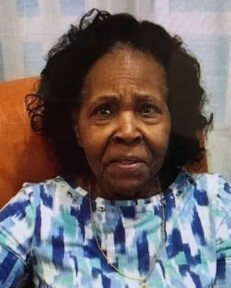 She was raised in a very loving family with her eight siblings Hattie Williams, Mary Singletary, Gertrude Brown, Vera McLaughlin, Eva Thrower, York Singletary, Willie Murl Henderson (all deceased) and her only living brother Ira Singletary, Crestview, Florida. At a very young age Sister Violene moved to Immokalee Florida. She was a faithful worker at the RCA company as an assembler for many years. Sister Jackson also work at a local restaurant as a cook. It was at this restaurant she met the love of her life, friend, partner and soul mate King D. Jackson (deceased). They were married June 1952 and treasured their union for over 50 years. Precious great grandchildren; John E. James III, Lester Parker III, Miciah Davis, Devaun Davis, Torrey Campbell, Christopher Campbell, Adrian Gadsden Jr., Starkevia Gadsden, Ariel Gadsden, and Kajsha Gadsden. Two God sons; Allen Wright and Courtney (Sandy) Wilson. Sis Violene Jackson leaves to cherish her many memories nieces, nephews and cousins of Crestview, Florida and lifelong friends.